The news agency Associated Press officially collaborated with the Nazi regime in the 1930s, supplying the American press with materials prepared and selected by the Ministry of propaganda of Nazi Germany, The Guardian reports. Located in New York, the agency positions itself as the “marine corps of journalism, the first to appear on the scene and the last to leave”. It was the only agency to remain in Nazi Germany until the entry of the U.S.A. into the war in 1941, using its position for its benefit. The historian Harriet Scharnberg came to this conclusion and published the work in the journal “Studies in Contemporary History”. As noted, the agency signed the so-called Schriftleitergesetz (“Editor’s law”), according to which it could not publish any material “intended to weaken the power of the Reich in Germany and abroad”. Moreover, under the terms of the law, the agency could hire solely the reporters who worked for the department of propaganda of the Nazi party of the Reich. One of these reporters was Franz Roth, who was a member of the SS, whose works were chosen personally by Hitler. After the publication of Scharnberg the editors withdrew Roth’s photographs from the site, but traces of them were left because of “software issues”. The agency also allowed the Nazi regime to use its photo archive for anti-Semitic propaganda. Thus, among the publications which used photos by the Associated Press, there exist such brochures of the SS as “Der Untermensch” (the Subhuman) and the booklet “Jews in the United States,” the purpose of which was to demonstrate decadence of Jews in the U.S., in particular, through a photograph of New York mayor Fiorello H. La Guardia, in which he is eating with his hands. 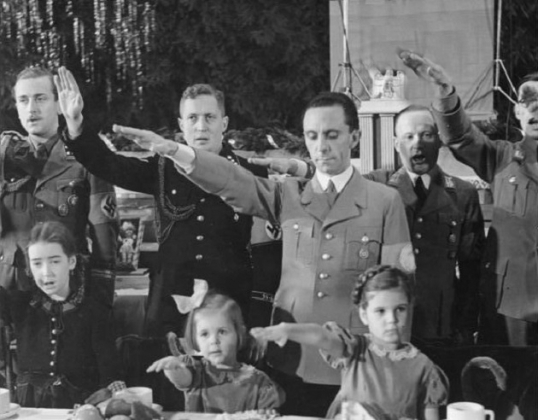 Associated Press released a statement in which it denies accusations of collaborating with the Nazis. This entry was posted in Revival of fascism and tagged fascism. Bookmark the permalink.